As a service to the public, Carpet Cleaning Fullerton would like to debunk some of the carpet cleaning myths you might come across when looking for a carpet cleaning service. Fleas love carpets almost as much as they love your pets. Ridding your home of fleas requires many steps, including treating pets, furniture and carpets. While regular vacuuming and carpet steam cleaning will undoubtedly remove a certain amount of fleas, fleas thrive in vacuum cleaner bags and dirt receptacles, and will continue to multiply on your pets if you do not use specific flea extermination techniques. Myth 2: Professional carpet cleaning costs too much. While the definition of 'too much' is entirely subjective, carpet manufacturers recommend professional home carpet cleaning every two years as a prophylactic measure to greatly lengthen your carpets' usability. So, what costs more? Carpet Cleaning Fullerton at affordable prices every two years or replacing your carpet years before you really need to? When considering a residential cleaning service, watch out for flyers and ads that offer deals that sound too good to be true, or promise low prices for a set number of rooms. These may be cases where cheaper is actually more expensive - once you read the fine print you might find square foot limitations or that aspects of the cleaning process which are included by reputable operations like Carpet Cleaning Fullerton, actually cost more when using a 'cheap' operator. Myth 3: All carpets need to be cleaned every two years. Carpet manufacturer's typically recommend having your carpets professionally cleaned every eighteen to twenty four months. This should be regarded as a general recommendation. Carpets installed in commercial locations, in homes with pets, small children or individuals with respiratory sensitivities or in rooms with heavy traffic will require more frequent cleaning. Carpets in other locations, especially seldom used rooms, still need regular maintenance, but may be able to go longer between Carpet Cleaning Fullerton professional cleanings . Have your carpets inspected by one of the professionals at Carpet Cleaning Fullerton today. 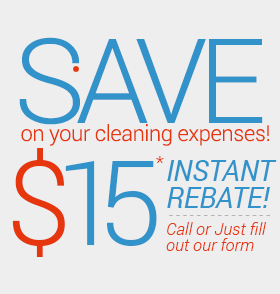 Give UCM Services Orange County a call at 714-922-0044 and ask about how you can save time and money by combining same-day cleaning services.